Kalamazoo native Paul Oosterbaan braved the elements for a big victory. KALAMAZOO, Mich. - For the second consecutive day, a midday storm produced a lengthy rain delay at the USTA Boys 16s and 18s National Championships, but it had no effect on the younger division’s top two seeds. No. 1 seed Connor Farren and No. 2 seed Ronnie Schneider, taking the Stowe Stadium courts for the first time, both posted straight-set victories just minutes before the skies opened. Farren finished first, shaking off opening set nerves to defeat Christopher Barrus 7-5, 6-0. Turning 17 in October, Farren has played only 18s competition since last year’s Kalamazoo tournament, but despite the first set jitters, the Northern Californian is comfortable with the pressure that comes with the No. 1 seed. "It’s great to be the top seed," said Farren, who in the Top 70 of the International Tennis Federation’s world junior rankings. "I love it. I think it’s the first time in a USA tournament that I’ve been a number one seed, because I’ve always played up. I think I’m one of the oldest kids in the (16s) tournament." Second seed Schneider is actually a few days older than Farren, but he has stuck to the 16s in USTA National Championships. The Indiana resident’s reason for playing the 16s in Kalamazoo this year is simple—he wants the wild card into the US Open junior championships that goes to the winner. He took one step closer to Flushing Meadows with his 6-3, 6-0 win over Samuel Lam Sunday. "There’s a big goal out there," said Schneider, who finished third at last month’s USTA Clay Court championships. 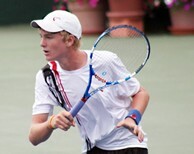 "Playing at the US Open juniors is a big goal of mine. I feel if I play my game and play well, everything will work out how I want it to. I just need to stay focused throughout the whole tournament." Schneider’s focus was directed at getting off the court Sunday morning. "I probably got done less than five minutes before the rain started," said Schneider. "It was sprinkling at 4-0, and I started running around the court, trying to get the match done, and thankfully I did. It was nice to get it done, so I didn’t have to wait any longer." Paul Oosterbaan, the No. 31 seed, who lives and trains in Kalamazoo, wasn’t as fortunate. Leading 6-3, 3-1 in his match with Brent Lett, Oosterbaan could have had his momentum stalled as he waited for an indoor court to open up at the nearby Markin Racquet Center on the Kalamazoo College campus. But the delay was brief, and Oosterbaan picked up right where he had left off, breaking Lett in the first game played indoors, and finishing the 6-3, 6-2 victory with a flurry of service winners. Although not all of his many local supporters had followed the match to its indoor location, Oosterbaan was still very comfortable in the familiar surroundings. "I was actually pretty happy with it," the Portage resident said of the move indoors. "I like inside more. I’ve played in here hundreds of times." The 6-foot-4 15-year-old has a serve that is particularly devastating on fast indoor courts, but his defense is surprisingly good, as he demonstrated on a very entertaining point during the outdoor portion of the match. "It was a long point, he should have won it a few times, and I had my chances to win it," Oosterbaan said. "I hit a tweener, and I had the crowd happy about that one, so that was nice." Three seeded players in the 16s failed to reach the third round, with No. 12 seed Martin Redlicki the most prominent name eliminated. Redlicki, whose older brother Michael won the 16s title last year in Kalamazoo, lost to Joseph Di Giulio 6-0, 6-4 in a match played entirely outdoors. Konrad Zieba defeated No. 27 seed Nicholas Crystal 6-3, 7-5, and Taiyo Hamanaka posted a 3-6, 6-4, 6-2 victory over No. 29 seed Ognjen Samardzic. No. 3 seed Noah Rubin sailed past Robert Seby 6-1, 6-1 in a match completed indoors, and No. 4 seed Corinteli also finished his 6-3, 6-3 win over Alexander Solonin at the Markin Center. The third round of 18s doubles, originally scheduled for Sunday, was postponed until Monday afternoon at the Western Michigan University courts, and with no main draw 18s singles play scheduled for Sunday, many players had an unanticipated day off courtesy of the rain. The third round of singles in both age divisions is scheduled for Monday at Stowe Stadium.